Based on the success of the earlier models, Intel has continued to improve the NUC line and recently released the first i7-powered model using a 5th generation Intel Core i7-5557U processor.Intel is positioning this model as a solution for multimedia and graphics-intensive applications, capabilities that may apply to some industrial applications. 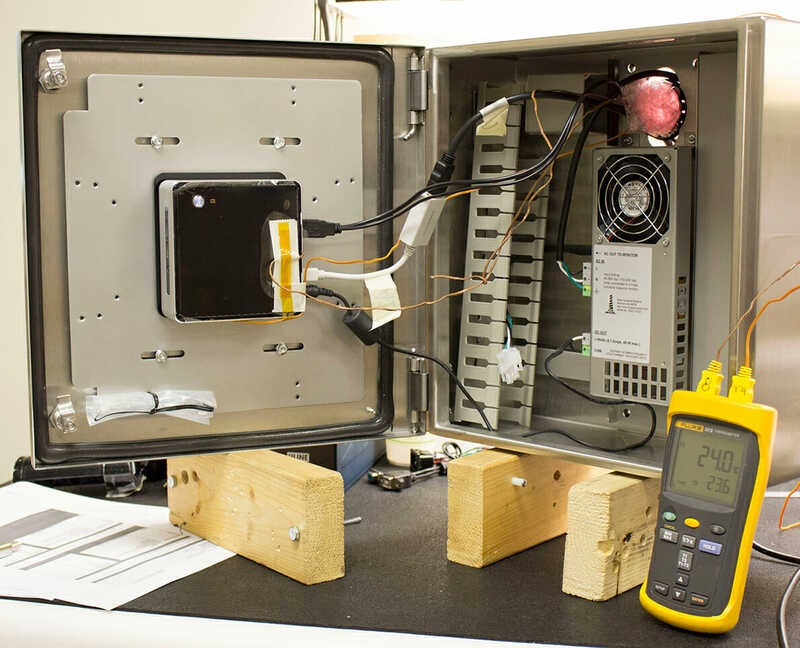 Given the popularity of the NUC line and the many customer questions we hear, we obtained a sample of the new i7 NUC, model NUC5i7RYH, and put it through the same heat testing we use whenever evaluating a PC for use inside of our industrial PC enclosures. The TC-ENCL line of enclosures is designed for products just like the Intel NUC. This line of enclosures provides a safe, cool, dry environment that allows placement of low-power devices in tough industrial environments, including those with full IP65/66 NEMA 4X wash-down requirements. 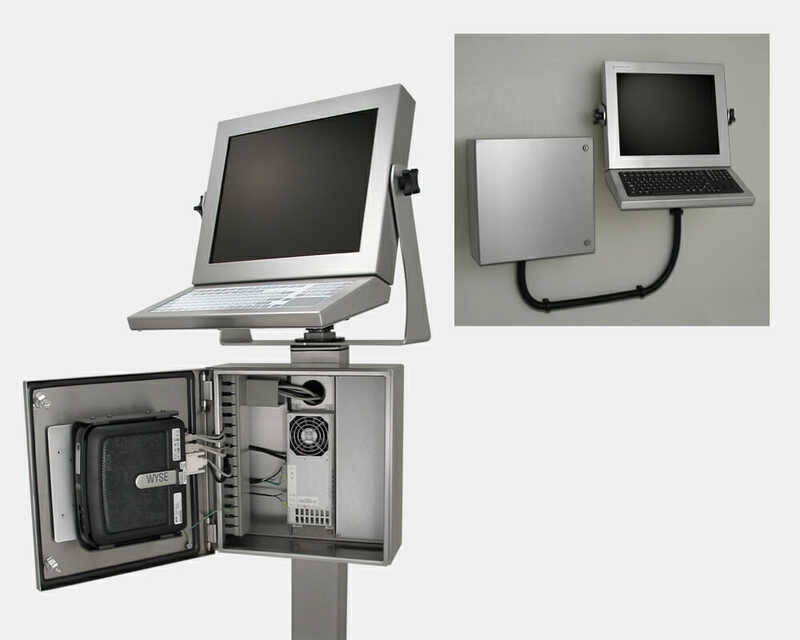 In addition to their environmental ratings, these enclosures include high-quality DC power supplies (in all the popular voltages), internal cable routing, and a variety of mounting options for either standalone or full workstation configurations. To test, heat sensors are placed on critical heat-sensitive components inside the PC (processor, memory, etc.). The PC is then run at a high utilization rate and the internal operating temperature rise is measured. The maximum internal operating temperatures for the components are determined by adding the temperature rise to the manufacturer’s maximum external operating temperature. 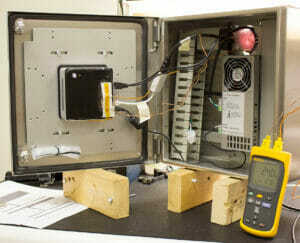 The PC is then installed into our TC-ENCL enclosure and the same internal operating temperatures are measured. The increase caused by being in the enclosure is then subtracted from the manufacturer’s maximum external operating temperature. What we found was not a surprise, despite the high efficiencies the NUC i7 is capable of, with power comes heat. At 75% processor utilization, our NUC i7 consumed 37 watts (compared with ~20 watts used by the i5-powered D54250WYK we tested last year). Paired with our smallest IP65-rated thin client enclosure, and based on the model’s 50°C max operating temperature, this results in a maximum ambient temperature of 32°C (89.6°F) outside the enclosure before temperatures rise above the NUC’s limits. The i7-powered NUC5i7RYH packs a lot of power in a very small enclosure, but generates a lot of heat and is difficult to cool when placed inside a small IP65/NEMA 4 enclosure. This reduces its usefulness for many industrial applications unless active cooling or a bigger enclosure is feasible. For climate-controlled or high-latitude locations this might be a suitable solution, but for more industrial environments the i5 or i3-powered models may be a better choice.